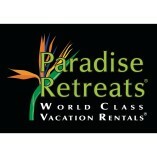 Paradise Retreats offers unsurpassed service to Guests and Owners of the vacation homes we represent. Our properties are beautiful and well-maintained, and have all the amenities you would expect in a luxury home. We specialize in satisfying the... needs of the discriminating customer, who expects the best in service and quality. Each of our properties offers a unique and special experience. Paradise Retreats offers a professional service. Paradise Retreats creates a great overall experience. We were overall impressed by the service Paradise Retreats provided. We were especially delighted with our local contact, Carol. She made us feel welcome, answered all the questions we had, and promptly responded to any issues that needed attention. Because of this prompt and personal service we would not hesitate to use Paradise Retreats in the future or recommend them to friends and family. We have rented with Paradise twice and have been happy both times. Their properties are always in great condition, beautifully furnished, well equipped, and in lovely locations. They have always responded quickly to questions or to issues during our vacations. I was pleased with the kitchen. It was well appointed. The setting is beautiful and peaceful. Chris, who greeted us, was a very pleasant young man. Only one tv worked and he came back to try and sort it out. We were all very pleased with Shadowbrook. The house was very comfortable. We enjoyed sitting by the pool and using the hot tub. The guest house was perfect for my sons! Loved the location of the house- tucked away in view of the mountains. It was great for celebrating my son’s wedding. Our family enjoyed our stay in Montecito. The home was fabulous and there was space for everyone to enjoy privacy and to all gather together. The home offered so many amenities and a super kitchen that we spent most of our time there at the house. It was truly like a resort! Thank you!!!! We will be back. We all loved the location and the quality of the condo, from first impression to departure. The instructions were timely and impeccable. The condo was spotless and had everything we needed to have a great experience. The proximity to downtown and the surrounding nightlife made the stay very enjoyable. The house was very nice, and the pictures showed us exactly what we were getting - the house was so well appointed and had everything we needed - would definitely stay there again. This property provides excellent spaces for a large family. Two cottages allow for some privacy at night and the open common areas are great for relaxing together indoors and out. Everything was clean; both houses and both full kitchens are well equipped. We had a great stay. We loved the location. A bit disappointed that we couldn't use the fireplace though. We all loved the soft sheets you use on the beds. We were extremely happy with Paradise. The home was lovely and everything was clean and in good working order. The service from Paradise was superb. They answered every question we had prior to our visit and even showed up when we checked in to be sure we knew how to work everything at the house. We will definitely use Paradise again and will recommend them to our friends! Loved the beach house! It was SO PERFECT in every way for us. Thank you! We would love to visit again soon. I was very grateful for the personal tour of the property ahead of time and for the greeting we received upon arrival. This was the perfect space for what we needed. Thank you for making it so easy! The property was amazing. We had a wonderful family reunion and enjoyed all aspects of Villa Bella. The personal service I received from Tera Neumann at Paradise Retreats made my experience amazing. From viewing the property to making the reservation and signing the contract, she was helpful and professional. Paradise retreats was very responsive if something needed to be taken care of in regard to repairs or requests. The house was very comfortable and we loved the location. We would like to rent it for next year too. We have been renting from Paradise Retreats for 7 years and have been most happy with the service, particularly from Tera Neumann who has been our contact. She has been very helpful and professional and we have great confidence in dealing with her. We have no hesitation in recommending Paradise Retreats. The property owner has built an almost fantasy like property. He and his friend joined us for dinner one night while we were making pizza in the pizza oven. The attention to detail this man thought of when building this property out, the quality, the vision... spectacular. The property is beyond whatever your expectations might be. My one wish for improving the experience is a later check out... 10:00am for 14 people to get up, shower, eat, pack and go is too tight... what happens is you have to start prep for departure the day before which is disappointing given if you have a weekend, you start to cut into the time to utilize the beautiful property. I would say at least 12:00pm check out would be reasonable, 1:00pm even better. Other than the checkout time, the property and the time my family enjoyed there is beyond words... SPECTACULAR!!! Many thanks to all of the staff at Paradise Retreats! I booked a luxury home with them directly and the experience from booking to checkin was just fabulous. Lots of great follow up emails confirming reservation, suggestions for activities in the area and every detail I needed to know for an easy arrival to the property and ease in accessing the home. The home itself (Los Arboles Ranch) was spectacular. I work for a vacation rental company in San Diego as an interior designer for vacation rentals so as you can imagine I have very high standards! Im super picky! This property surpassed my highest expectations. The home was so well stocked and sparkling clean. The property is very well maintained and cared for. We had the most amazing stay and I will without a doubt be returning for a future stay. It is tempting to rent a different home next time since they have so many wonderful listing options, but I am so fond of this particular home and left with some of the best memories that I would just have to rent this home again to recreate the wonderful time we all had. Thank you Paradise Retreats and Los Arboles Ranch for helping me to have the best 40th birthday ever with all of my dearest friends. We have all now decided we need to do yearly retreats! We had an excellent experience with Paradise Retreats. Responsive to guest requests and very professional. We loved the unit we rented and would rent it again. Our stay was a perfect ten. The home was beautiful and comfortable and within an easy walking distance to town. We all had a fantastic time and are planning to return again next year.